Third largest Telecom player in India,” Idea Cellular” has launched it’s new innovation in the range of Smartphones by slotting ,”Idea Zeal” in the list. With Idea Aurus, ID-918, the Ivory and now,” Idea Zeal” it looks like company has aimed to build up their strong portfolio in smartphone category in India also. Idea Cellular creating a strong impact over Semi-urban and rural techno-enthusiasts as they are upgrading their 2G phones to 3G. Opening the box, viewing it’s appearance, this device features a 3.5-inch TFT Capacitive Touch Screen display with 320×480 of pixels resolution (screen size is quite comfortable in use whereas resolution is quite low). Defining it’s Platform dependency, one might loose the excitement about the device as an outdated version ie. Android v2.3 gingerbread Operating System has been used on this device, most probably due to hardware limitations. Idea Zeal ise powered with a Qualcomm Snapdragon Processor clocked at 1GHz. Enumerating it’s Storage Specifications, it comes with 512 MB of RAM, Internal memory of 4GB which can be expanded up to 32 GB via micro SD card slot. In terms of Photography, Idea Zeal is offered with a primary fixed focus camera rated at 3.0 MEGAPIXEL with MPEG 4 and HVGA video recording. Briefing on Connectivity features, this device support Wi-Fi, A-GPS, Bluetooth, USB and a 3.5 mm Audio jack,2G and 3G which would serve as a companion to transfer data. 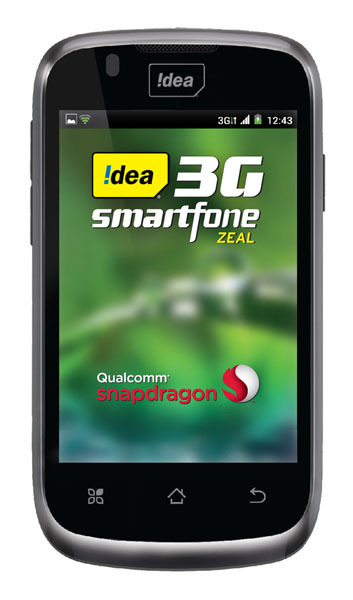 To make the deal more attractive, Idea is offering data usage offer for 3G users with the purchase of this smartphone. After purchasing Zeal, a consumer will have to get a recharge of Rs. 261, which will give them 1GB of free 3G data every month for first 3 months, along with a free 3 months subscription of Idea TV. To Power it up, this device support 1300 mAh of battery capacity which gives a standby time of over 200 hours and talktime of over 4 hours approximately depending on 2G and 3G Network. It comes loaded with built-in social media applications such as Facebook, Twitter, Orkut, Google and Youtube, besides Idea TV. The price of Idea Zeal is Rs 5,390 and it is ready to rolled out across the online retailers in the country.